RP31555CZ is rated 5.0 out of 5 by 2. Rated 5 out of 5 by Lorrie from Looks Great! This was just a replacement of a 26 year old trip lever that was discolored- it works fine and looks good...price was very good. Rated 5 out of 5 by Mona from Impressed Purchased this due to our old overflow plate was 30 years old and needed replacement. Was concerned due to size for ours was larger, but it fit and was a breeze to install and the cost was a huge saving and received the order extremely quick. Not disappointed at all, the convenience alone was well worth it. How far apart are the screw holes in the overflow plate? I am replacing a DB overflow cover and want to know if this Delta overflow plate is compatible with the existing hardware (from the 1980s) that is behind the tub. Is this available in an over sized diameter (3 1/2&quot; ) as opposed to the standard 3&quot; dia. Does this include the plunger assembly? If not, could you include a link? Thanks. Would you please provide a picture of the BACK of the plate, showing what that part of the trip lever looks like? Does this part include the lever, plastic collars, and spring behind the plate so that it can attach to the lever that operates the drain? 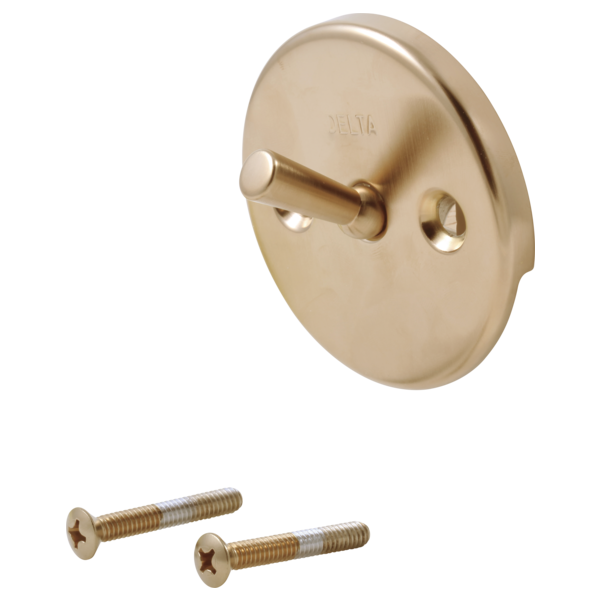 I am trying to replace an old polished brass with stainless steel trim package in my shower/tub combination. Do you have any trim packages in stainless steel to replace #1400 series Monitor TNT have the overflow plate in stainless steel that will fit? Thank you for your question. Delta Faucet model # RP31555 is not available as a separate part in Stainless Steel. However we do offer a complete bath waste assembly in Stainless Steel. You can purchase a toe-operated assembly by ordering an RP693SS or a trip lever assembly by ordering an RP691SS from your local retailer or wholesaler.